Here's part of the Herald-Statesman article that accompanied the photos (previous page) of the Yonkers Transit garage fire in August 1962. I finally found time to look at the Ohio Museum of Transportation's on-line GM New Look production lists. Below I'm providing the information I found as to the Fishbowls Yonkers Transit acquired from GM. 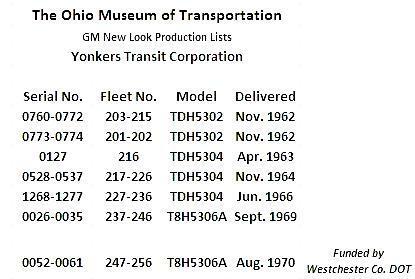 The Ohio Museum shows Yonkers Transit eventually had a fleet of 56 GM New Looks and I've found the Museum's lists to be very accurate. The lists showed none of the Fishbowls were acquired until after the August 1962 garage fire. The first fifteen began arriving three months after the fire in November 1962. One more was acquired in 1963. There were ten bus orders placed in 1964, 1966 and in 1969. 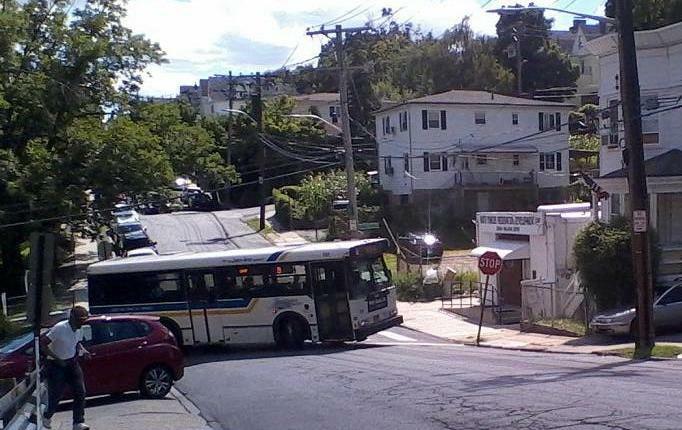 I think the latter was the last order Yonkers Transit Corp. financed. 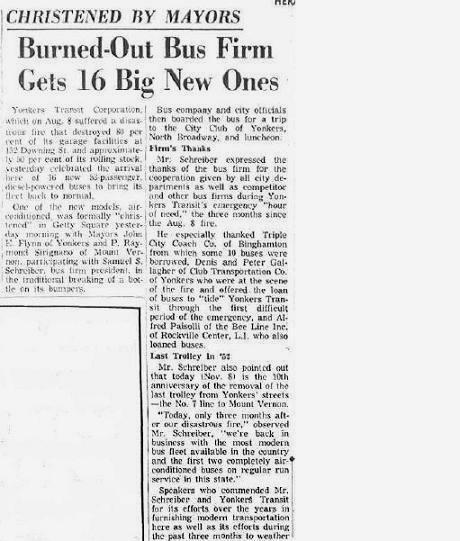 One final ten bus order was delivered in August 1970 but those buses were paid for by Westchester County and (I think) leased to Yonkers Transit. Here is the news photo that accompanied the November 8, 1962 Herald-Statesman article above. The photo was taken in Getty Square in Yonkers. The three men in front of the bus are the mayors of Mt. 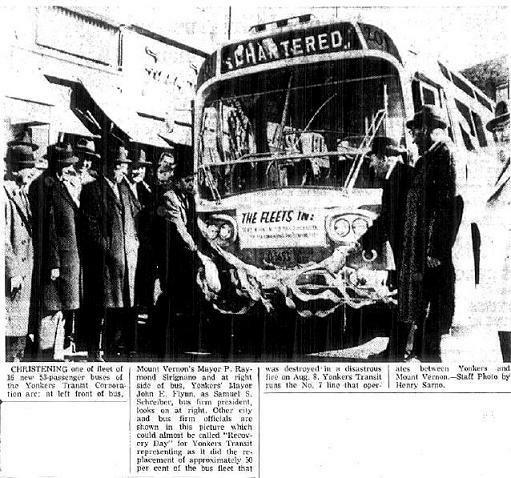 Vernon and Yonkers (doing the christening) and looking on is Samuel Schreiber the president of Yonkers Transit Corp. 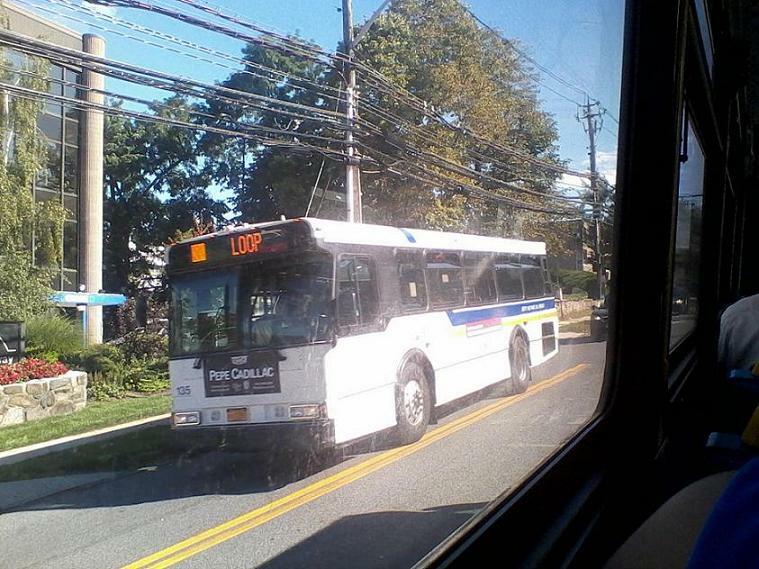 The bus shown is 201 (the number to the right of the destination sign is hard to see in this version of the photo) and this bus is said to be one of two air-conditioned New Looks Yonkers Transit was acquiring. Presumably 202 was the other. Interesting info - nice sleuthing job and thanks for sharing! You're welcome Jim. It was a lot of fun for me. Btw, yesterday I got a day off from work and used Bee-Line to run some errands in north Yonkers. It was a beautiful day too. I was waiting at the southbound stop for a bus downtown. I wound up riding a 9. One point of interest is that the bus in the photo, Orion V 630, is normally assigned to the Valhalla garage and I don't think would usually be working a 5 run. (When I commuted on the 13 I rode 630 many times.) Except I recall the late Rich Stiller, who was in operations planning with Westchester Co. DOT, telling me this time of year Liberty Transit often shifts buses between the Valhalla and Yonkers garages. That is done because the bus routes in southern Westchester have higher ridership and encounter heavier traffic. Shifting the buses evens out the wear on the fleet. Possibly 630 is temporarily working out of the Yonkers garage. Below is a grab shot I took of a northbound No. 5 at the stop at Nepperhan and Odell Avenues. A few minutes later a Bronx-bound No. 2 pulled up, another NABI, and I boarded. A few blocks away we turned left into Tudor Woods, onto Gateway Road, and an Orion on a northbound No.2 was waiting at the light. He had stopped a bit short of the white stop line to give our bus turning room. Yonkers-bound No. 6 stops at St. John's Hospital on No. B'way. Cooperation! I snapped this photo (in a hurry!) from the southbound No. 2. Your posts are very interesting, as I drive through the Executive Blvd route a few times each month, and my sister and I have explored the summit with the Hastings water tower. Allow me to link a 1922 TARS map that shows the Uniontown streetcar already abandoned, marked by cross-hatches. I note that the streetcar did not challenge the climb over High Street as the 6U now does. 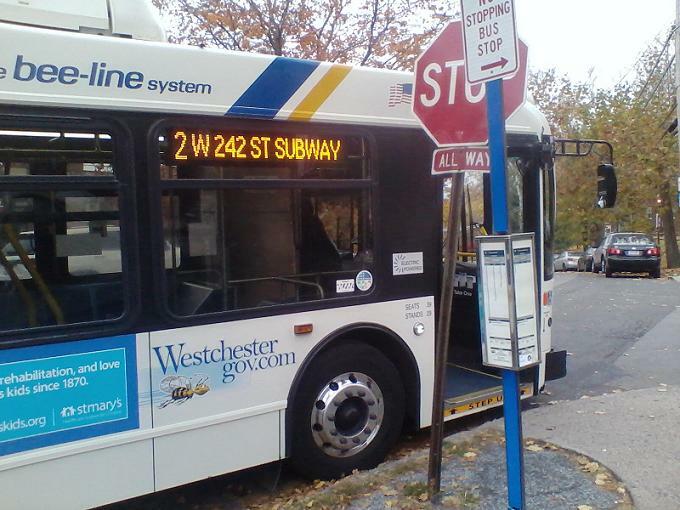 Thanks Joe I enjoy learning about transit, especially in Westchester. 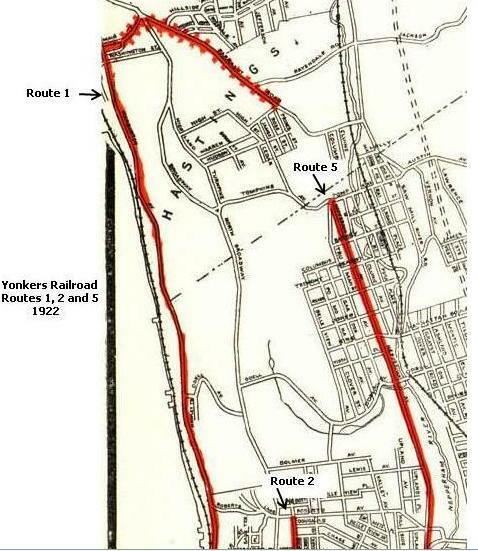 Doing a little sleuthing I discovered that according to a Hastings local history site and other sources, Yonkers Railroad discontinued the streetcar route into Uniontown -- which was a connecting car just running on the Main Street, Hastings-Uniontown segment -- in April 1919. YRR had been claiming serious losses on the service and wanted to drop the Uniontown segment. At the same time YRR stopped service on Route 1 north of the Yonkers city line for the same reason: costs exceeded revenues. 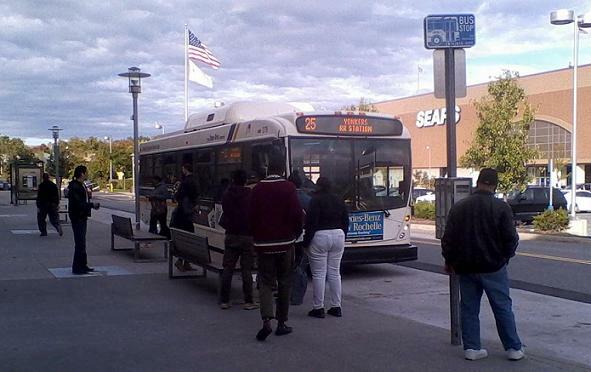 YRR was willing to restart service on the main part of the route (but not to Uniontown) in exchange for permission to charge an additional zone fare for Hastings riders. The New York Public Service Commission allowed the charge (an extra five cents) and the 1 service into Hastings (as far as Warburton Avenue and Main Street) restarted in January 1920. (Route 1 operated down Warburton Avenue into Yonkers and then along Broadway to the IRT subway station at W. 242nd Street in the Bronx.) 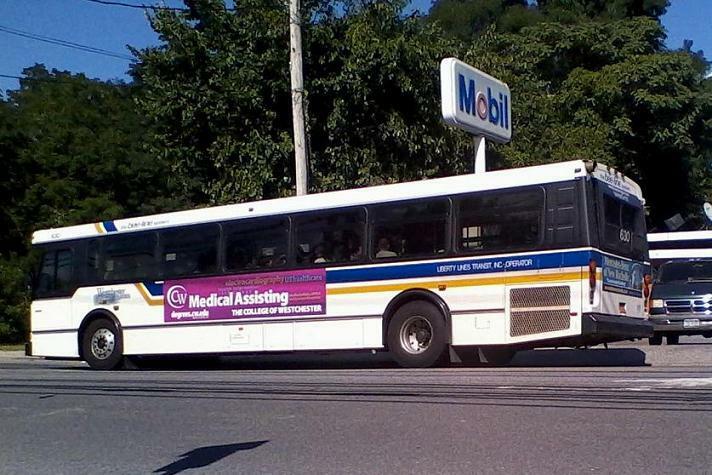 A year or two later YRR agreed to operate a bus shuttle service between Main Street and Uniontown. It was one of the earliest 'bustitutions' in the area that I know of and might possibly be TARS' first bus route. I'm certain it was Yonkers Railroad's first bus operation. By the way I'm attaching a part of the TARS map that shows subsidiary Yonkers Railroad's Route 1 in northwest Yonkers and in Hastings. The dashed line was the Uniontown extension. Also shown are the northernmost ends of Routes 2 and 5. I don't think TARS will mind my posting part of their map! On the way home, on board a Bronx-bound No. 2 NABI, the 9 passed us near St. John's Hospital on North Broadway. 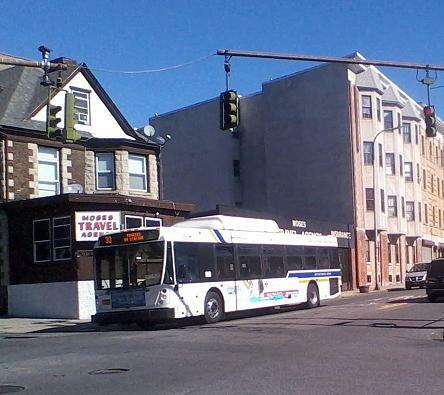 It was the 135 again (the 9 Route is assigned just one bus that makes a loop through north Yonkers every hour, from 8:40 in the morning until 5 PM). I'm standing at the Ridge Avenue stop as 135 turns right off Sullivan Drive onto Ridge Avenue. It's a tight turn. Note that 135's electronic destination sign was malfunctioning. 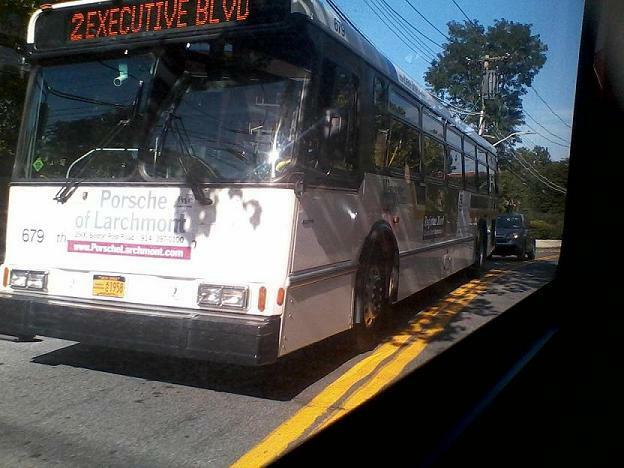 But there's no mistaking what route this bus is on when you see it on North Broadway in Yonkers! Been too long between posts but I've been so busy at work, no time for bus riding or bus photoing. That changed Wednesday when my wife was unable to pick me up after work. I went to the Xavier Drive bus stop in the Cross County Shopping Center in Yonkers, across from the main entrance to Sears, to get a No. 25 home. I don't think the Xavier Drive stop at Cross County is as well known as the main stop at Cross County on West Drive near Macy's, directly off Central Park Avenue and served by the No. 20, Bee-Line's busiest route. 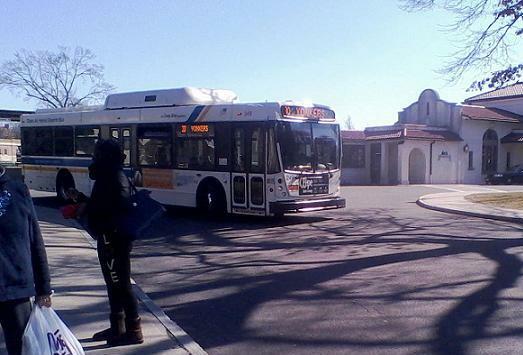 The Xavier Drive stop serves different Bee-Line routes, too: Routes 25, 26 and 55. It was a beautiful afternoon and I snapped a couple of fone fotos. First was a No. 55 bus, a NABI. 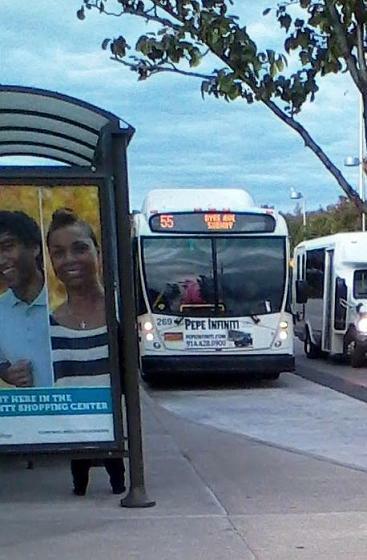 The Route 55's heritage goes back to Surface Ways and operates (mostly via Mt. Vernon) between the Dyre Avenue subway stop (No. 5 train) in the NE Bronx and the Cross County Shopping Center. The next bus, another NABI, was the one I rode to go home (via a transfer to a No. 2). The No. 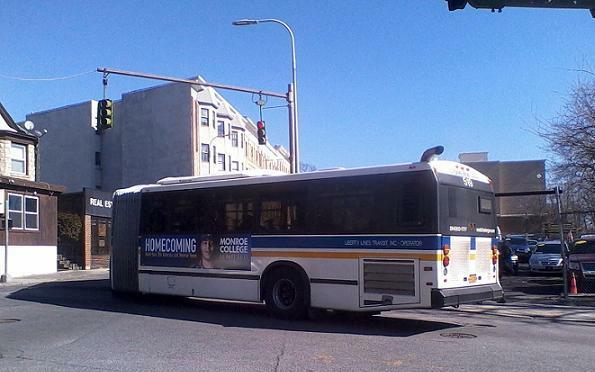 25 was once a Club Transportation route, and operates between the 238th Street subway station (No. 2 train), on White Plains Road in the north central Bronx and the Metro-North train station in Larkin Plaza in downtown Yonkers. The 25 operates via E. 238th Street to Kimball, Midland and Ashburton Avenues in Yonkers, looping through the Cross County en route. It's a busy route. Not the greatest photo -- I expected the 55 would pull up further -- but I'm posting this anyway as the 55 doesn't get photographed much. This morning I had to run some errands. This afternoon I had to run a few more, all in north Yonkers near St. John's Hospital on North Broadway. This morning I took the car; this afternoon I rode Bee-Line buses and when I was finished and on my way home, I walked over to Tudor Woods, to Dehaven Drive and Gateway Road, to catch a Bronx-bound No. 2. When I used to ride the 2 regularly I usually boarded at a stop within South Westchester Executive Park but the 2 doesn't serve SWEP on weekends. On Saturday and Sunday all the No. 2s (or nearly all) begin and end their runs in north Yonkers in Tudor Woods. When the bus (NABI 289) arrived the operator asked those of us waiting to "Hold on a minute," while he did a quick walk-through. A moment later I'm on the bus and ready to go home! Been a while since I posted anything; been a while since I was on a bus! Yesterday I went to Getty Square and decided to take the bus and skip having to look for a parking space. Glad I did, it was a very relaxed trip. Since a four-alarm fire on South Broadway last October (it destroyed a row of stores south of Main Street) the northbound 6 has to detour off the usual route in downtown Yonkers. 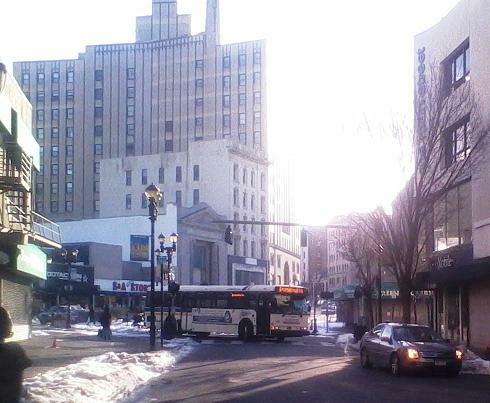 The bus no longer goes east on Hudson Street upon leaving Yonkers railroad station and then left (north) on South Broadway. That's because the single traffic lane on South Broadway into North Broadway has been closed to traffic since the fire. (Not sure why.) Instead the No. 6 (also the 25 and 30) go south on Buena Vista Avenue to Prospect Street, continue onto Nepperhan to New Main Street, then west on New Main to Getty Square where they can turn onto North Broadway. First I boarded a No. 2 on Park Avenue. It was 512, a Neoplan Artic. Not unusual on the 2 run but not common either. I snapped the photo as we turned off Park onto Ashburton Avenue. The bus operator had no problem making the turn. I caught a Pleasantville-bound No. 6 to get home. The Orion on the 6 is turning right off Main Street onto North Broadway. The office building looming in the background is 20 South Broadway. 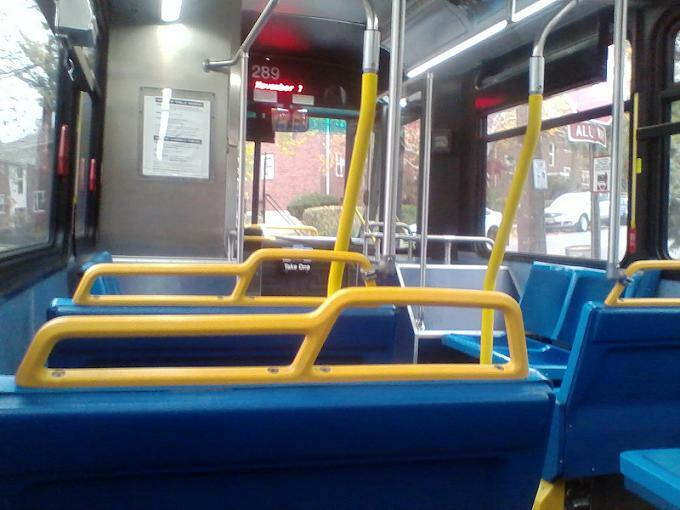 Yes, all BeeLine buses have 2X2 seating. Today I had the day off from work and had to pop over to Bronxville from Yonkers. 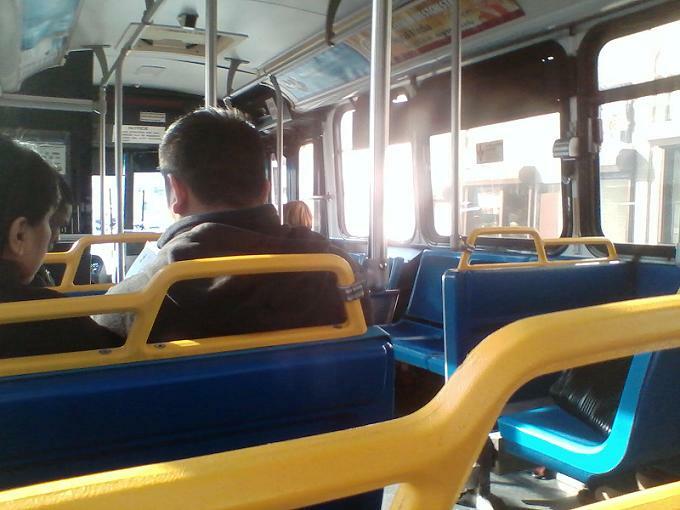 It was such a nice day I decided to take the bus. I started out on a Bronx-bound No. 2 to Ashburton and Palisade Avenue. That's where I waited for the 30 to Bronxville. The No. 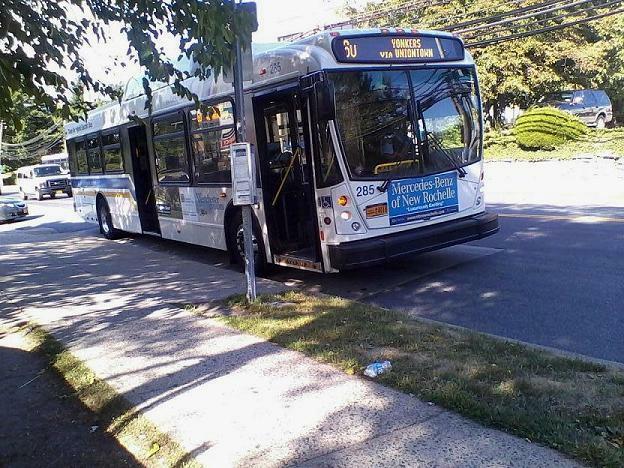 30 is a Yonkers-New Rochelle route that runs via Saw Mill River Road, Lockwood Avenue to Palmer Road to Bronxville train station. It's an old Club Transportation route that Bee-Line extended to New Rochelle via Eastchester and Pelham. First a Yonkers-bound 30 came west on Ashburton. On the way home: a New Rochelle-Yonkers No. 30 arrives at Bronxville's Metro-North Harlem Line station.